Super RARE opportunity to own one of the few homes in Adora Trails with unobstructed views of the gorgeous San Tan Mountains. Like new home, with extremely private lot and no neighbors behind (EVER). This Adelaide model is highly upgraded with more than $85,000 in builder upgrades. This includes a gourmet kitchen, upgraded wood looking tile throughout, a multi-sliding glass wall, and much more. Over $68,000 spent on the resort style backyard. Boasting a gorgeous private California Pool, complete with water feature, in-floor cleaning system, and dual pumps for easy clean. Why wait 6-10 months to build when you can own this move-in ready home complete with window coverings, fans, and completed back yard. Don't wait, this one will sell fast!! Adora Trails is a master planned community in Gilbert,AZ. The community has features that will keep even the most active of families entertained. 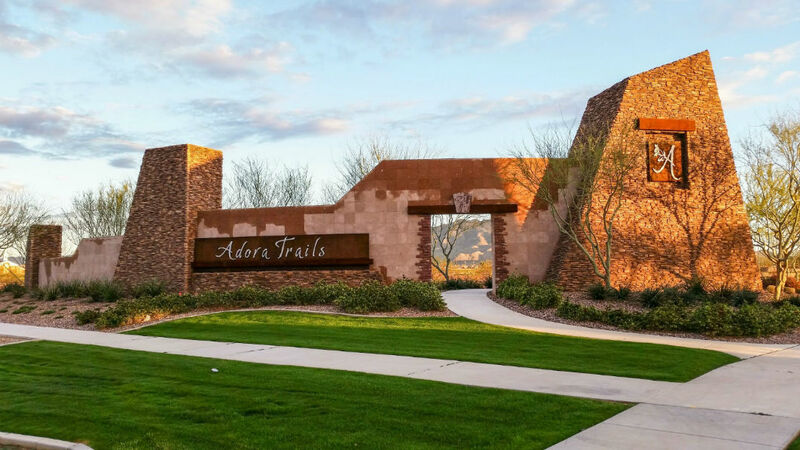 Adora Trails has more than 12 miles of trails that meander throughout the community, perfect for those who relish the Arizona sunshine and fresh air. Not only do you have views of the The San Tan regional park from just about every angle in Adora Trails, but it is also just minutes away and the park offers hiking, biking, horseback riding, bird watching, etc. Adora Trails also offers a community center which comes with a lounge area and a fully equipped kitchen, where you can hang out after your work out in the Adora trails fitness center. This fitness center offers state of the art fitness equipment and is staffed 7 days a week. The fitness center also offers group classes, yoga, boot camps, and a one of a kind virtual fitness trainer or "fitness on request". The virtual fitness kiosk offers a wide variety of fitness classes to choose from. After selecting a class from the kiosk, the projector screen lowers down and the instructor begins the class. This is just another innovative and amazing amenity that Adora Trails has to offer. After your workout you can get cleaned up in the locker rooms provided within the community center. 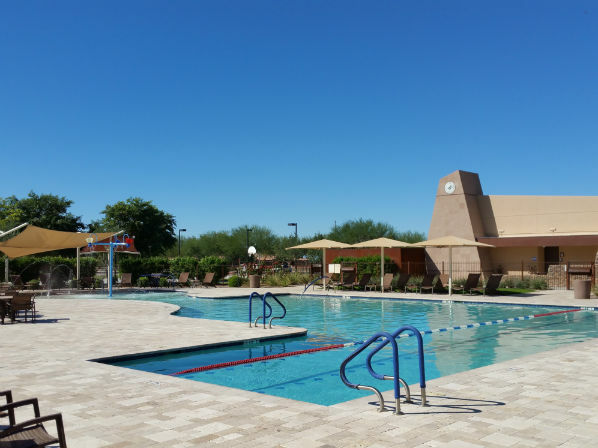 Adora Trails has a community pool and even a splash pad for those hot Arizona days and even has a community lake that is stocked with fish for your catch and release pleasures. There is always something to do in this master planned community, but if you need something else to occupy your time, you'll find plenty to do in Gilbert, AZ. Just about 3 minutes Southeast is the Seville Golf & Country Club which offers private golf and social memberships. And if your not into the whole country club setting, there are ample public golf courses nearby. Trilogy Golf Club is about 5 minutes away and Toka Sticks and Greenfield Lakes are less than 10. The nearest grocery store is Fry's Marketplace and is just down the road. Albertson's, Safeway, and Bashas are less than 5 minutes away, and Walmart, Winco, Costco, and Sam's Club are all within a 15 min. drive. The San Tan Village Mall is next door to these shopping centers and offer some of the best shopping and dining in the State. If your looking for something other than the provided fitness center at Adora Trails, there are numerous to choose from and all within a 15 minute drive. Desert Fitness is by far the closest as it is just down the road, but L.A. Fitness, Mountainside Fitness, Anytime Fitness, Snap Fitness, and multiple crossfit centers are less than 15 minutes away. Fast food is in abundance and all within 15 minutes of Adora Trails. Some of the fast food restaurants within 5 minutes away are, Taco Bell, McDonalds, Subway, Burger King, Panda Express, Dunkin Donuts, Bosa Donuts, Little Caesars Pizza, Pappa Johns, Pizza Hut, Barro's pizza, Rosatis pizza, Dominos, Coldstone, and Dairy Queen. In & Out, Chic-Fil-A, Cafe Rio, Costa Vida, KFC, El Pollo Loco, and Carl's Jr. are all less than a 15 minute drive away. Adora Trails is just a short 38 min. drive to the center of Phoenix and the commute is a fairly easy one. If you are a traveler and are in need of an airport, you have two commercial options. The Phoenix-Mesa Gateway Airport is just a quick 15 minute drive and the Phoenix Sky Harbor International Airport is about 33 minutes from the Adora Trails community center 7465 S Adora Trails Blvd, Gilbert, AZ 85234. Adora Trails offers an on-site elementary school which is within walking distance and offers parents the convenience and safety of having an on-site school. Charlotte Patterson served on the Chandler Unified School District's Governing Board for 16 years and the Adora Trails on-site school has been named after her (Charlotte Patterson Elementary School). Adora Trails residents live within the boundaries of some of Gilbert's top schools. Gilbert is home to Chandler Unified School District and Gilbert Public Schools. Children K-6 can attend Patterson Elementary and/or enroll in any of the other nearby schools. 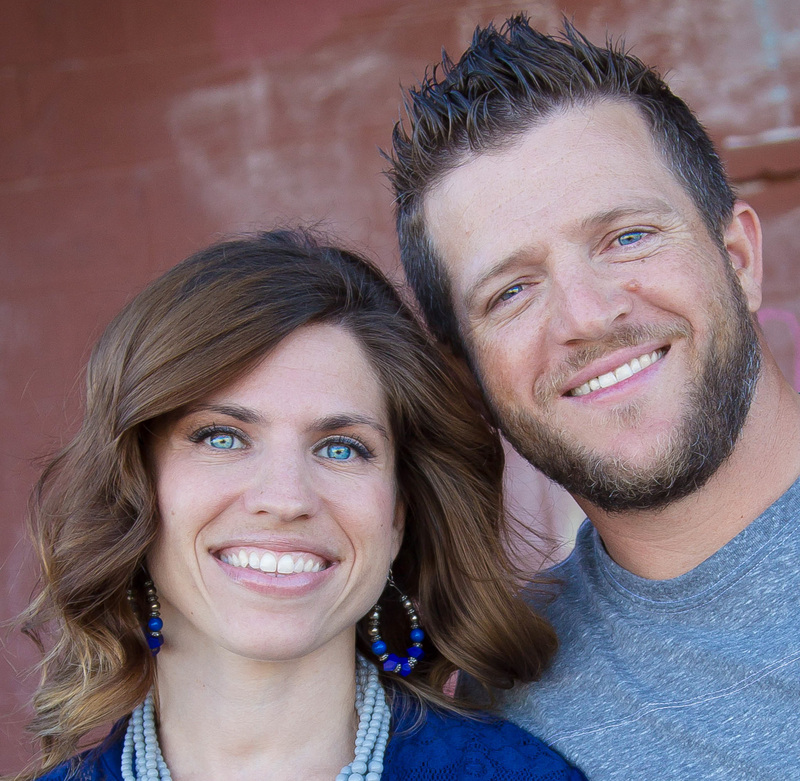 Willie & Coy Payne Junior High, Basha High School, and Perry High School are the nearest schools within the districts. GreatSchools.org names Gilbert as on of the nation's best cities to live and learn, so you know your kids are going to get some of the nations best education. Selling your Adora Trails home? Get your home value instantly below.